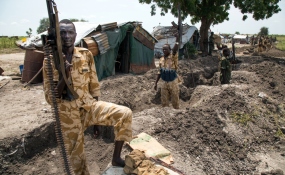 How is Online Hate Speech Affecting South Sudan Conflict? Status Extension Urged for Sudanese, South Sudanese Nationals in U.S.
"We regret to report that a 5-year-old girl was confirmed dead at Juba Teaching Hospital where she was taken following the incident yesterday," said WFP South Sudan Country Director Adnan Khan. "WFP extends its deepest condolences to the family and will provide all possible support to them in this terrible tragedy. Our thoughts and prayers are with them. An official investigation is underway and the aircraft will be carefully reviewed to discover what caused it to be so low." The Ilyushin-76 cargo aircraft was contracted by WFP to airdrop food in South Sudan. It hit a tree and then the metal roof of the single-storey house as it tried to land at Juba airport in heavy rain and low visibility. The aircraft's jet blast damaged a second house as it climbed sharply up. The aircraft then diverted to Entebbe International Airport in Uganda. During an emergency landing, its main landing gear collapsed because metal roofing sheets were entangled in it. "The safety and well-being of the people of South Sudan are our top priority. We and the aviation authorities will closely examine what happened so that more innocent lives are not put at risk," Khan said.